Pippin. Want to do karaoke with Broadway? 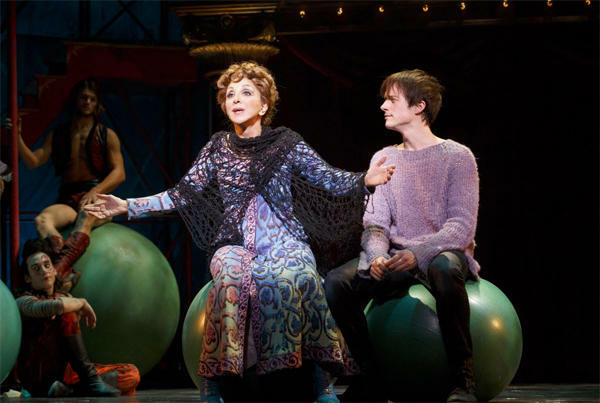 On a recent Sunday, I caught a matinée of Pippin at the Music Box Theatre. I hadn't seen the stage version, but I was pretty acquainted with the soundtracks of most musicals; Just check my Pandora. But for some inexplicable reason, Pippin completely escaped my mental-database for Broadway musicals, and I had gone my whole life without even hearing one song from the show. My understanding prior to seeing Pippin, was that the show was as follows: A kid named Pippin joins the circus. The end. Yeah, as I quickly found out, (Shocker, huh?) I couldn't have been further from the heart of the musical. The interior of the Music Box Theatre was decorated to look just like the circus with multi-colored flags and striped streamers,and the stage was transformed into a tent. The show opened with nothing but a huge shadow on the curtain which resembled a giant woman. The woman got smaller and smaller until BOOM, out came the actress who played the ring leader, Patina Miller. I instantly recognized her from her emotional Tony Speech, and as she stalked around the stage singing "Magic to Do," it became clear to me why she won. Pippin, unsure about the direction his life was headed, sought out advice from his Grandmother. She was wearing a typical old-lady ensemble and looked pretty unassuming. Then she broke out into "No Time AT All" and I was on the edge of my seat! And the whole number was all the more special because we were invited to sing the chorus with her! Initially, I was a bit hesitant. I didn't know the melody so I was shy, but by the second time around, I was belting it out, grinning from ear-to-ear as I read the lyrics that were projected onto the stage. It was like large-scale karaoke but with a Broadway cast! Some point during the second act, I caught a glimpse of something brightly colored in my peripheral vision, and turned to see a little boy in a clown suit, pulling a long red, purple, and blue paper chain out of his mouth and passing it along my row. We each ripped off our own piece and I immediately tied mine around my neck like a scarf, thrilled to have a souvenir from the show. On my way out of the theatre, still sporting my oh so fashionable paper chain scarf, I spotted a red rose on the floor and picked it up, extremely happy to have 2 souvenirs! Motown. Are you ready to dance in the streets? Heathers The Musical. What's a new perspective on an old goodie?